'Art fusion' is a term that is defined as the collaboration of artists and brands, where the artist's artwork and the brand's production and marketing expertise aim to create something that is beneficial for both the entities. Maserati adopted this strategy back in the late 50s, when the race car building experts at Maserati joined hands with artists from Italy to create painstakingly beautiful road cars - grand tourers, coupés, sedans, roadsters - they have given us some of the best of all these body styles. 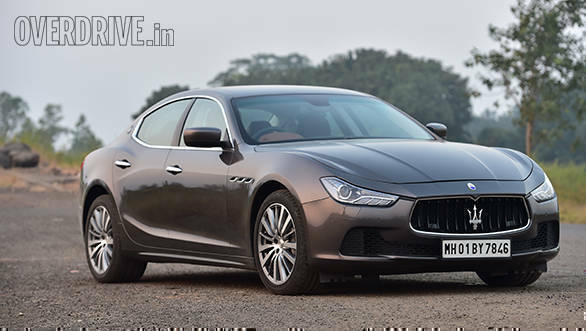 So when the Germans decided to merge the elegance of a four door sedan with lustful curves of a coupé - Maserati had no trouble in responding with its Italian art and therefore was born the third generation Ghibli. In Maserati's illustrious history, the Ghibli has existed as a 2+2 grand tourer, followed by a sporty two door, four seater coupé. In its new form it is a proper four door coupé that takes on the likes of the Audi A7, the BMW 6 Series Gran Coupé and the Mercedes-Benz CLS. They all look beautiful with their long dimensions and sloping rooflines, but the Ghibli looks gorgeous. Getting such a low slung nose on a sedan is not an easy task and then flanking it with headlights inspired by the current crop of Ferraris just adds the right amount of attitude on that smart face. There are plenty of lines on the body, but each one of them looks purposeful. In my four days with the car, I got more stares and smiles than I got with the RS7 or the S-Class coupé. Even with that understated grey colour. I particularly like the humps over the front and rear wheel arches, both of which prominently stand out and lend this sedan an appearance of a sportscar. It's that form that gets blood rushing to your head and makes you go weak in your knees. You want to keep looking at the car, but want to quickly get behind the wheel too. Contributing further to that effect are the sporty 19-inch alloys and the massive brake callipers - both of which come with a wide choice of designs and colours respectively. Now that's the kind of customisability I want - not just colour choices for the upholstery. Speaking of upholstery, the cabin on our tester came with a black dashboard and dark brown, double stitched leather for the seats and dash inlays. At night, it gets quite dark in this cabin and there is no ambient mood lighting either. The latter may not work for you considering the lounge-like cabins that the competition offers. But I quite like it as it gives the cabin a snug feel - much like a sportscar. During the day the colours look quite rich and I like the elegant design. Look closely though and you will feel like there was some sort of a rush to bring out the Ghibli on a short deadline. The infotainment system for example seems like it came for a car of the previous decade and not something designed for a current generation car that also otherwise appears so bespoke. The user interface in the multi-info display on the instrumentation looks and works nicely, but the interface on the infotainment reminds me of the old generation of smartphones (Even the phone icon uses a picture of a phone with a stick out antenna and a physical keypad). Equipment and toys to justify its price are scarce - all you get is a rear windshield blind, satellite navigation, cruise control, dual zone climate control and proximity sensors that go berserk in Indian traffic and will keep overriding active phone calls and music even if a bee were to fly close to the car. I couldn't find a way to turn off the sensors either. There is a reversing camera too but a low-resolution one at that. The steering mounted controls are confusing and need getting used to. Some of the plastic and rubber bits just don't gel with its luxurious positioning and stick out like a sore thumb. If you know your Ghiblis well, then you will appreciate the fact that the rear seats are now roomier than the previous Coupe models and actually justify the four seater claim. The seats are contoured quite nicely and knee room and headroom are adequate if not luxurious. Its rivals certainly offer more in terms of space and equipment if you are looking to be chauffeured around. This is strictly a driver's car. With that frowning face you expect the Ghibli to have an angry Italian V8 under the hood with shrieks and fire-breathing snarls coming out of that exhaust system. After all, the design looks racy and fast. But to me the Gibli looks better when it arrives slowly down the street or when cruising gently on the highway - only exuding that sense of power and not really shouting it out. The engine under the hood also seems to agree with that approach. 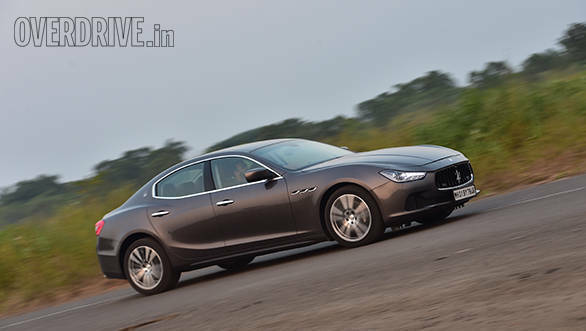 It's a sensible 3.0l diesel and that in itself is a new deal for a Maserati. A diesel Maserati, who would have thought!? At 275PS it isn't exactly a power monger, but with 600Nm on tap, it makes sure that there is adequate amount of torque as and when required. But by that I don't mean that it is too composed or laid back. In fact it builds up pace quite rapidly when needed and the eight speed ZF gearbox is quite responsive too - in the city, on the highway and around the twisties. The steering column mounted paddle shifters are the icing on the cake - in form and function. The healthy torque also makes it quite fuel efficient (10.8kmpl city / 15.6kmpl highway). But while the engine and gearbox are quite responsive for a diesel, the drivetrain doesn't quite have the sense of rush like a BMW does with its 3.0-litre oiler. In our tests the Ghibli diesel managed to hit the ton from standstill in 6.9s - which is a click slower than what the Jaguar F-Pace managed with all that crossover bulk. The Ghibli diesel doesn't set any new benchmarks then, but it is astonishing how Maserati has masked the typical clatter of a diesel motor with a tempting (albeit synthesised) grumbling sound that you would otherwise get only from a petrol. In fact, apart from the tachometer, which red lines at 4,500rpm and the characteristic slow-revving nature of a diesel motor, there is no way to tell that this is a diesel engined car - there are no badges on the body or even on the engine cover for that matter. 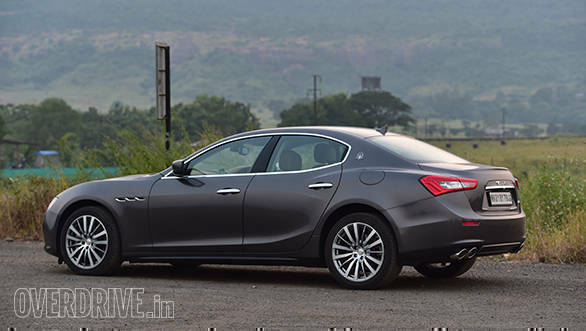 The Ghibli employs a multi-link rear suspension and a double wishbone front with a stabiliser bar. Our tester also came with the optional Skyhook suspension which adds adaptive dampers to the mix and let's you cycle between a stiff setup for spirited driving or a softer setup for a relatively more comfortable ride. Even on the latter, the ride is bit firm - much like what you would expect on a sporty sedan. The 19-inch feels contribute more to that effect. Add to it the low ground clearance and you have a car that needs you to tread cautiously over speed humps. Want to commute in a rush? Don't take out the Ghibli! 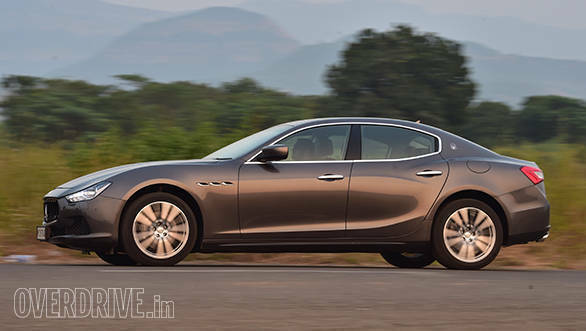 The stiffer suspension setup is a conscious decision though as Maserati doesn't want to rob you off the sportscar feel even in its sensible sedan form. Push the car around bends and you will know what I mean. It's not precise, but displays the typical character of a rear-wheel-driven car and you can literally feel the rear wheels pushing the chassis forward. You realise that all of Maserati's stability systems are working overtime to keep the car on the intended line. And that is what makes it a fun driver. 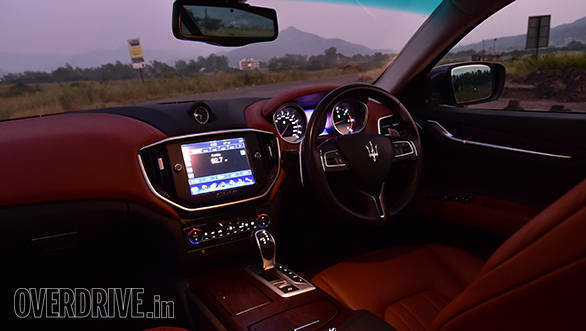 The three-meter long wheelbase is class leading and while that may not reflect in the cabin space, it does have a positive effect on the cornering capabilities of the Ghibli. The protruding wheel arches also act like judgment points to know where the four corners of this long car are and that is certainly handy when the Ghibli starts dancing wildly around bends. The front feels a tad floaty, but the hydraulic steering is responsive and loves chatting away to glory. The way it adjusts weight is a bit iffy and feels inconsistent - more so on our car as the left wheel had pronounced nibble. But with all mechanicals working as intended, I'm sure the Ghibli will be a lot of fun. The car shows that promise. But have fun with it and the otherwise healthy fuel economy figures start dwindling into singular numbers. Why would I mention fuel economy on a fun car like this one? The price. Over the years Maserati has produced such gorgeous cars that it is considered automotive art. But if I were to put the concept of 'art fusion' in today's perspective, then Maserati is the artist now and Fiat is the brand that markets it. The Italian giant wants to sell at least 50,000 Maseratis every year and the Ghibli has most of that weight to bear being the entry level model. So while it takes on its German rivals with its form and function, it demands a premium to prevent the brand from diluting. That works (arguably) in the global markets, but by the time the Ghibli comes to the Indian shores via the CBU route, that premium gets magnified by a huge margin. So huge in fact, that it drifts from the league of the A7 or the Gran Coupé and enters into the territory of the S-Class. Would you still buy a sensible Maserati at that price? I wouldn't. I would rather wait and put my money on the wilder, petrol powered, 440PS Ghibli S. That, would be some rush!